A woody aromatic leathery fragrance boasts top notes of clary sage to strike a balance between freshness and refined texture. Jimmy Choo Man Blue is a dynamic new masculine fragrance by Jimmy Choo. Confident, elegant and yet almost casual and sporty in its element. 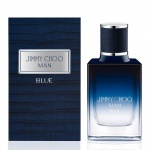 Jimmy Choo Man Blue combines both woody and aromatic facets in equal measure/.